Harlingen Attorney Eddie Medrano arrived at his office on East Harrison yesterday to find his "Beto for Senate" campaign sign had been vandalized. He has filed a police report and intends to restore the sign. HARLINGEN — Heriberto “Eddie” Medrano arrived at his office yesterday morning to find his candidate’s large political sign vandalized with red spray paint. The local longtime attorney was frustrated and angry about it, so he filed a police report. Medrano has been proudly showing off his political sign. The November election is around the corner, and it doesn’t matter what side of the political spectrum you’re on, damaging someone’s sign or taking it is a crime. In this case it was Medrano’s Beto O’Rourke sign. He is the Democrat challenging Republican U.S. Sen. Ted Cruz in what has become a contentious race. But that shouldn’t matter, according to Medrano. A former federal prosecutor, he took an oath to protect the rights of citizens and enforce the law. He said vandalizing a political yard sign is a misdemeanor crime. Harlingen police and the Cameron County District Attorney’s Office agreed. Vandalizing someone’s campaign yard sign is a misdemeanor and falls under criminal mischief. Harlingen police said if the sign is stolen that would be a higher charge. Police said there have not been any other reports of vandalized or stolen political yard signs. Medrano, a supporter of O’Rourke, contributed $1,000 to support his candidate in exchange for the 4 foot by 8 foot yard sign. He said his sign had been up for two weeks on his property located at the corner of 21st and Harrison. And not until yesterday did he notice anything had happen to it. “This vandalism has encouraged me to order another sign,” Medrano said as he scraped the red paint off with a razor blade yesterday afternoon. He said people had stolen his smaller campaign signs recently, and he didn’t think anyone would be brave enough steal to a large one. Harlingen resident Homer Rodriguez, 66, swooped into Medrano’s front yard to ask where he could get a Beto sign for his home and business. Medrano was standing along the road next to his sign when Rodriguez pulled up in his truck to talk. Rodriguez said he was in the Army for seven years with the 101st Airborne Division. He had not noticed the paint on the political sign before he stopped spontaneously. Rodriguez said he used to vote Republican and he never disrespected his neighbor’s Democratic signs. Rodriguez said he served in the military defending the First Amendment and the Constitution. “I am a United States veteran and I support Colin Kaepernick for kneeling because that is his right,” Rodriguez said. Heriberto Medrano believed the marking on his Beto O’Rouke sign was an incomplete “No” sign similar to the one used in the 1980s film Ghostbusters. But it appears to be something else. The big letter “Q” is known as the QAnon. According to reports, it is a conspiracy movement that aims to overthrow big bankers, royal dynasties and the CIA. 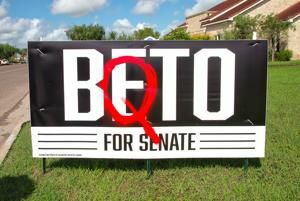 Someone or a group supporting this movement seems to have left the hidden message on the biggest Beto O’Rourke political campaign yard sign in town. The “Q” has appeared in campaign rallies for Donald Trump. According to reports, it first appeared on the Internet in October 2017. Supporters believe “Q” is a high ranking officer in the Trump Administration with high level security clearance attempting to overthrow the “DeepState,” a decision making hierarchy hidden within the government unaffected by changing administrations.